The Union Minister for Electronics & Information Technology and Law & Justice, Shri Ravi Shankar Prasad releasing the Guidelines for Development of e-Governance Applications (GuDApps), at a function, in New Delhi on September 12, 2017. The Secretary, Ministry of Electronics & Information Technology, Shri Ajay Prakash Sawhney and other dignitaries are also seen. New Delhi: Union Minister for Electronics & Information Technology Shri Ravi Shankar Prasad today launched a nation-wide hackathon #OpenGovDataHack. As part of the Startup Eco-system Development program, NIC and IAMAI have collaborated to conduct Nation Wide Hackathon #OpenGovDataHack across seven states of India. It aims to Support & Showcase potentially great Ideas/Talent from Inner India by reaching out in their own State/City (7 Cities). It is to enable them making their ideas developed into Apps/Infographics primarily by use of Open Government Data around the themes of Drinking Water& Sanitation, Transport, Education, Crime and Health to a stage, after which it can be evaluated by jury and be selected for Prizes and future support/funding. “The big data analytics should focus on poor & under privileged and facilitate inclusive growth. While aiming at taking lead in data analytics it must be ensured that technology is inclusive, affordable, transformative & developmental. 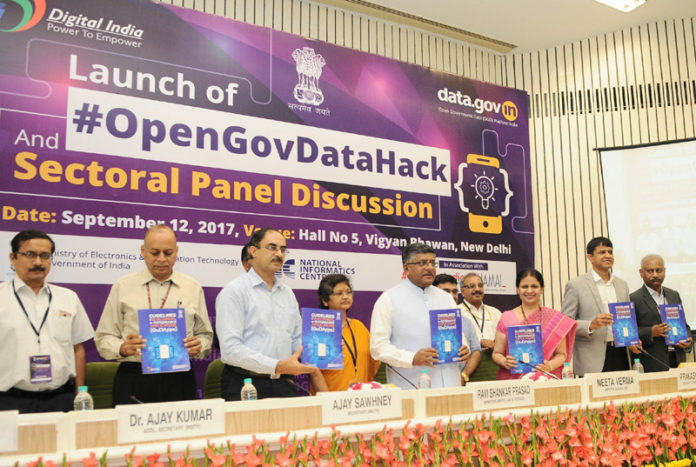 #OpenGovDataHack being taken up in seven states would catalyse further start up movement. I would like assure you all that the Government is determined to hand-hold successful start-ups and make it a big success.” added Shri Ravi Shankar Prasad. The workshops will be organized for Stakeholders Sensitization, identifying Problem Statements and Data Gathering at respective cities. Students, Community, Startups, Academia, and Industry etc. can participate. The #OpenGovDataHack will being with the oonsite City Challenge, a 24 hours Hackathon event will be held at 7 centres/ institutes/ organizations across Hackathon cities on different weekends. The participating teams will be required to submit Apps prototypes and Info-graphics. Selected Apps prototypes from all seven onsite city Centre and online submissions will be taken forward for App development. Each team will be given 2 months of mentorship/incubation to develop the App, post which the teams will submit the final Apps for evaluation. The apps will be evaluated by a panel of jury comprised of the members from the Community, Government, Academia and Industry etc., and the shortlisted teams will be invited for a presentation on the App. The Hackathon process will conclude with an International conference on Open Data, wherein the winners of the Apps Challenge will be awarded. The Open Government Data (OGD) Platform India has been set up by the National Informatics Centre (NIC) in compliance with National Data Sharing and Accessibility Policy (NDSAP) 2012. The objective of the policy is to provide proactive access to government owned sharable data along with its usage information. A number of Hackathons, Data Meets and Open App Challenges have been conducted to bring out innovative applications, info-graphics and visualizations using the government data. A separate Community Portal (http://community.data.gov.in) has been launched to provide a common platform for knowledge sharing through contributioin of blogs, info-graphics, Visualization, etc. using data available on the platforms. Similarly a dedicated event portal (https://event.data.gov.in) also helps in management of workshops, hackathons, challenges, etc. OGD has organised 24 major events/apps-challennges/hackathons, workshops/training/awareness sessions, roundtable, etc.so far. OGD Platform is available as Software as a Service (SaaS) model. Following Open Data Portals have been created using OGD SaaS: Sikkim Open Data Portal (http://sikkim.data.gov.in)Tamil Nadu Open Data Portal (http://tn.data.gov.in) and Surat Municipal Corporation (http://surat.data.gov.in).